Welcome to the website of Belmont Presbyterian Church! We hope as you browse through our website you will find something that may be of interest to you. 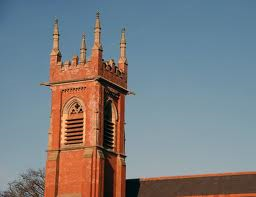 Belmont Presbyterian is situated in the East Side of Belfast, Northern Ireland, an area popular with young families and retirees. We are a multi-generational congregation, served by a team, under the leadership of Rev. Nigel Craig. Belmont has a rich history stretching back to 1862, and is a congregation of the Presbyterian Church in Ireland, which grew out of the 17th Century Plantation of Ulster. We would love to welcome you to our services on a Sunday (10:30am/ 7:30pm). Our morning services last for about an hour, following the familiar patterns of Reformed worship (prayer, praise, Scripture reading, preaching, baptism and communion), blending historic and contemporary elements. Our children and young people leave for their own activities after the first 15 minutes of the morning service; we also have a crèche. There is wheel-chair access and a `loop system’ for those whose hearing is impaired. After the service everyone is welcome to the hall for a cuppa and a chat. Our evening services are more informal, begin with coffee/tea, and meet in the Hyndman Hall. The essence of historic Presbyterian belief is to be found in the so-called `Five Solas of the Reformation’: Scripture Alone (Sola Scriptura), Christ Alone (Solus Christus), Faith Alone (Sola Fide), Grace Alone (Sola Gratia), to the Glory of God Alone (Soli Deo Gloria). In plain English it means that all we believe and do ought to be based on the Bible, and that Jesus Christ stands at the centre of the Bible’s message. As God’s Son he did everything necessary, through his life, death and resurrection, to open the way for us lost people to get into a right relationship with God again. That means we don’t have to rely on our own performance to get there, but instead trust Jesus completely. Now that’s grace – outrageous kindness on God’s part! Once we’ve been reconciled to God we’ll want to bring pleasure to Him in everything we think, say and do. It’s great to know that this is possible because God has given us His wonderful Holy Spirit and the fellowship of the Church. We’d love to see you at our services on a Sunday, or at any activity throughout the week. Please do not hesitate to get in touch with us. Please note: there are no Evening Services, in June, July or August. There will be no evening service this Sunday instead all members are encouraged to attend the Sinclair Seamen’s Harvest of the Sea service on Sunday 24th at 6.30 pm. 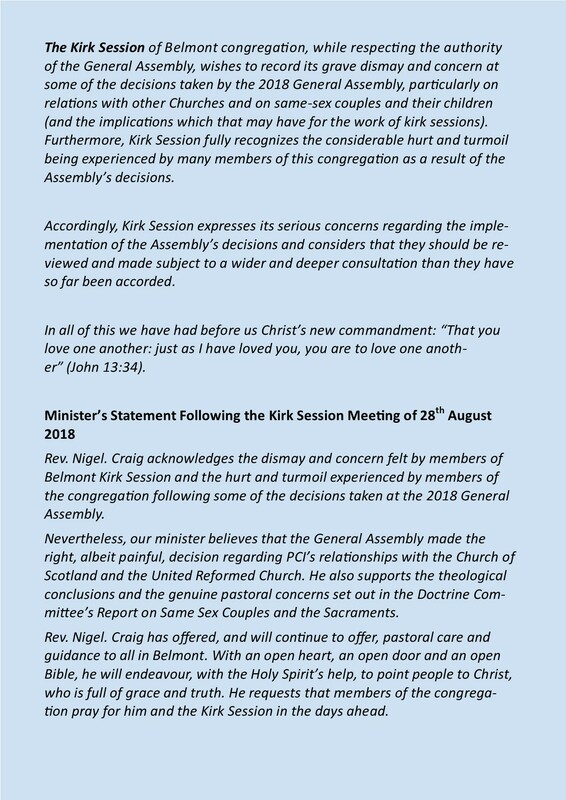 The following statements were read out to our congregation on Sunday 2nd September 2018, sent to the Moderator of the General Assembly and published in our church magazine.